Main interest: Waterfowl; breeding passerines. Regular/annual: Siskin; common warblers; breeding Little Grebes. Scarcer species & rarities: Hen Harrier, Red Grouse, Crossbill. Access: From Tramore take the coast road to Fennor and turn right from there at the church. Veer left at the next junction and a short distance further on, a fork in the road leads left to Ballyscanlan Lake, or right to the top of the hill from where Carrigavrantry Reservoir can be reached by walking down through the forest near the waterworks. From Waterford take the Cork road and 4.5 km west of the Regional Technical College turn left (signposted for Tramore). 4 km further on veer right, just beyond Ballynaclogh Cross Roads. Proceed then for about 3 km to Ballyscanlan Lake on the right, or left up the hill through the forest for Carrigavrantry. These two small lakes, 7 km from Tramore, are set in extensive conifer plantations (mainly young re-planted stock at present), on either side of the Ballyscanlan Hills. Ballyscanlan Lake is bordered on one side by a forestry plantation with open farmland on the other and much of the lake is fringed by a small reedbed, more prolific on the west side. The lake can be viewed from the road and is always worth checking, though bird numbers are usually low at any time of year. Small numbers of Mallard, Tufted Duck and Pochard occur in winter, and there are occasional records of Goldeneye. In summer, Mute Swans and Little Grebes breed, with Water Rail likely. Breeding passerines include Sedge Warblers and, in the forest canopy and scrub nearby, many Chiffchaffs and Willow Warblers. 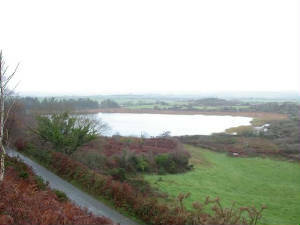 Carrigavrantry Reservoir is a popular location for trout anglers. For this reason and its small size, bird numbers are always low, even in winter. Mute Swans usually breed, and Common Sandpipers have done so in the past. The reservoir is of regional importance for the calcifuge plants present on the west shore, otherwise rare in Waterford. The pine forest overlooking the reservoir has proved good for Crossbills in some years, with breeding recorded in the 1980s, and Siskins also breed. Hen Harrier too are regularly recorded, as are the more common raptors.